^ CFPS 2014 found that 5.94% of the population declared to be members of "other" religious categories besides the five state-sanctioned religions. An additional 0.85% of the population responded that they were "Taoists". Note that the title of "Taoist", in common Chinese usage, is generally attributed only to the Taoist clergy. CFPS 2014 found that a further 0.81% declared that they belonged to the popular sects, while CFPS 2012 found 2.2%, and CGSS 2006-2010 surveys found an average 3% of the population declaring that they were members of such religions, while government estimates give higher figures (see the "statistics" section of the present article). ^ 1.0 1.1 For Chinese Family Panel Studies 2014 survey (which surveyed a sample of 19,260 people) results see release #1 (archived) and release #2 互联网档案馆的存檔，存档日期2017-02-25.. The tables also contain the results of CFPS 2012 (sample 20,035) and Chinese General Social Survey (CGSS) results for 2006, 2008 and 2010 (samples ~10.000/11,000). 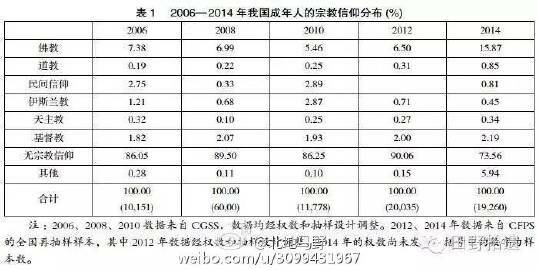 Also see, for comparison, 卢云峰：当代中国宗教状况报告——基于CFPS（2012）调查数据 (CFPS 2012 report), The World Religious Cultures, issue 2014. 存档副本 (PDF). [2014-08-07]. （原始内容 (PDF)存档于2014年8月9日）. p. 13, reporting the results of the CGSS 2006, 2008, 2010 and 2011, and their average (fifth column of the fist table). ^ 3.0 3.1 3.2 3.3 国家宗教事务局中国宗教概况 互联网档案馆的存檔，存档日期2017-01-18. ^ William M. Johnston. Encyclopedia of Monasticism. Taylor & Francis. 2000: 169–171. ISBN 978-1-57958-090-2. ^ 中國基督徒約佔1.8%. 中新社 (明報). 2010-08-11 [2010-08-20]. ^ 棺材被毀、屍體遭起棺：江西殯葬改革引發民怨. 王霜舟 (紐約時報). 2018年8月3日 [2018年8月3日].